Val Laird Designs has a really sweet "What is Love" block of the month freebie. Take a look. Geta's Quilting Studio has a great tutorial to show us how to make a fabric bowl. Take a look...it seems easy enough. The Long Thread has a cute goose softie called Lucy Goosey. Drop over and grab the pattern. Sew Much Time, Sew Little Fabric is sharing "Life's A Hoot" BOM with everybody. How exciting. An owl stitchery BOM....whooohooottt.....quick take a look owl lovers. Thanks Paula for sharing this. Hey this is a great idea for us who like a particular thing and cant find fabric we are looking for...like me and owls...I would buy all the fabrics I could with owls on. But know I could even stamp my own...what a hoot!!! Go across to Creative Kismet and learn how to stamp your own fabric. Fall Is in the Air stitchery over at Kaaren's blog....thanks again for another lovely stitchery Kaaren. Tanya from The Sampler Girl has a heap of freebie cross-stitch charts to tempt all you stitchers. Shawnette from I'm Seeing Raggedies has a few different free patterns to grab. With Halloween coming up she has Frankie and Bride to make. Take a look at the other freebies Shawnette has on her left side bar. What a great idea....making slippers. I love the way these look and they also look easy to whip up. It is a free pattern over at the Pink Slipper Project and such a worthy cause. Dannielle from Princess Nimble Thimble has a lovely prim Annie doll pattern to make. She also has a rabbit, embroidery, strawberries, a teapot cozy and other patterns to share. Thanks Dannielle. 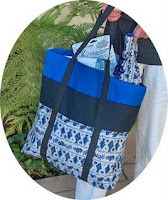 SewCalGal has a nifty 12 Pocket Bag freebie. Take a look if you need something to carry a lot of stuff around in. Happy Threads has a heap of cute cross-stitch patterns. Owls, chickens, hearts, sheep, cats and so much more. May Britt from Abyquilt has a sweet stitched notebook cover to make up. There is a cute heart shaped needlecase freebie over at Goosie Girls blog. Margot over at Xic Xic has a free cloth doll pattern to share. She calls her Liz. Pattern Mart have a heap of freebies but this is a cute idea. Tags with next years calender on them and cute Raggedy Annie graphics.Take a look around here to see more prim patterns. Scroll down towards the bottom. Yes well with Christmas not far away I guess we need to start thinking of what to make. There is a great prim santa freebie over at Pattern Mart to grab. Joyful Blogskins have some really cool backgrounds too. A lot of natural scenery blog backgrounds there. Blogger Blog Backgrounds has some really cute backgrounds and headers. Simply Blog It Backgrounds has some great background freebies. With these ones you do not create a new gadget. You simply edit your html code and add the little code they give you. Easy peasy.